START PUTTING YOUR MONEY TO WORK FOR YOU! Proven, time-tested strategies on how to invest safely for monthly cash flow. Learn powerful tactics for entry-level investors. Techniques for finding and evaluating the best investments for your portfolio. Guessing and hoping are dangerous – start using the right approaches. Discover high-yielding, alternative investments that provide reliable, monthly income. Learn the fundamentals of managing your own portfolio so you can stop donating your hard-earned money to mutual fund managers that are charging you excessive fees. Mathematical proof that you don’t need a lot of money to start investing. Learn the key variable that amplifies investment outcomes regardless of how much money you start with. STOP relying exclusively on the stock market. Learn about other income-generating investment options out there that Wall Street doesn’t want you to know about. Most investors have no idea these things even exist. The 3 major sources of low-maintenance income and how you can seamlessly incorporate them into your life. This is the foundation for putting your money to work for you. Discover how professional investors earn high returns, while actually taking on less risk. Learn to use the proprietary investment master model that flourished through market crashes, the real estate bubble, and the Great Recession, and it still cranks out growing, monthly income. I continue to use it to this day. How to use market volatility and those brutal “down days” to your advantage. Learn how to extract inflated profits from the markets, while everyone else is panicking and running for the exits. Secrets to minimizing risk. Learn strategies for protecting your investment income and your portfolio during economic turbulence and challenging market conditions. The relatively unknown income investment that I’m currently using to earn steady 8-9% cash flow returns – and it has nothing to do with the stock market. Want a sneak peek inside the program? Listen to this free audio sample from The Pay Me Plan home study course. Learn about the unique philosophy and approach behind this exclusive program. 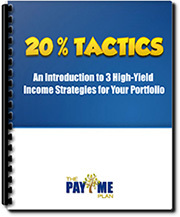 Get a glimpse into how entry-level investors around the world are using the principles revealed in The Pay Me Plan home study course to get their money working for them. Discover three investing techniques that can generate income returns of 20% annually. This free report contains private information and actual case studies of the strategies in action. Please enter your name and email address below to confirm we have permission to send it to you. Your blueprint and details on the strategy I used to earn a 59% annualized return on stock that traded flat. Stock ideas on how you can create a stream of investment income that grows at 10.8% annually. Case studies showing real-life examples of The Pay Me Plan at work. See how to properly apply the investment master model to maximize your cash flow. Gain exclusive access to the question-and-answer period of this invitation-only event.